The American distributor would not accept Hammer’s original idea to have a Dracula film without Dracula and it took quite a lot of persuasion to convince Christopher Lee to resurrect a character with which he was becoming increasingly disenchanted. 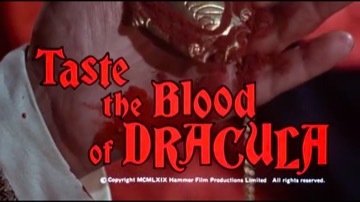 This was the first of three films directed for Hammer by Hungarian Peter Sasdy, the others being “Countess Dracula” (1970) and “Hands of the Ripper” (1971). For Christopher Lee’s Charlemagne company, he also directed “Nothing but the Night” (1972, starring Lee and Peter Cushing). This was also the first Hammer film for actor Ralph Bates, who later appeared for them again in “The Horror of Frankenstein” (1970), “Lust for a Vampire” (1970), “Dr Jekyll and Sister Hyde” (1971) and “Fear in the Night” (1972). He later starred in BBC TV’s sitcom “Dear John”, before his premature death in 1991. He was married to actress Virginia Wetherell, who appears in Hammer’s “Dr Jekyll and Sister Hyde” and “Demons of the Mind” (both 1971). Linda Hayden enjoyed a short career in horror films and also appeared in Tigon’s “Blood on Satan’s Claw” (1970) and the American International/Amicus co-production “Madhouse” (1974, starring Peter Cushing and Vincent Price).